Ankara Numune Training and Research Hospital, Dermatology Clnic, ANKARA Introduction: Pruritus, a common symptom in the elderly, is usually a chronic condition lasting for more than 6 weeks. Chronic pruritus in the elderly may be caused by systemic diseases, including renal diseases, iron deficiency anemia, parasitoses, hepatobiliary diseases, leukemia, lymphomas, and endocrine disorders. 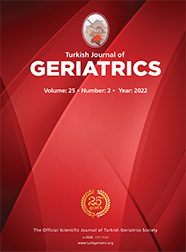 In this retrospective study, we aimed to investigate the relationship of systemic diseases with chronic pruritus in the elderly. Materials and Method: Descriptive statistics were computed for means, standard deviations, and frequencies. The chi-square test or Fishers exact test was used for statistical analysis, with a significance threshold of p<0.05. Results: Totally, 631 consecutive patients [307 males and 324 females; mean age, 73.34±6.49 years (range, 6595 years)] were enrolled. In 292 patients, at least one laboratory test was performed to identify the etiology of chronic pruritus. In 42 patients, abnormal laboratory test results led to the diagnosis of a pruritus-related systemic disease. This study revealed that 21 patients had iron deficiency anemia, 2 had solid malignancies, 7 had hypothyroidism, 8 had renal disease, and 5 had hepatobiliary diseases. There was a statistically significant relationship between performing laboratory tests for chronic pruritus and detecting a pruritus-related systemic disease (p<0.001).